1. King of the Ammonites. At the beginning of Saul's reign Nahash attacked Jabesh-gilead, and when the people of that place asked for terms of surrender he gave them the alternatives of having their right eyes thrust out or of being put to the sword. The inhabitants of Jabesh-gilead then obtained a respite of seven days and sent messengers to Saul, who assembled an army and routed the Ammonites (I Sam. xi. 1-4, 11). It appears, however, from I Sam. xii. 12, that Nahash had threatened the Israelites before Saul was made king, and that it was for this reason the Israelites insisted upon having a king. According to Josephus ("Ant." vi. 5, § 1), Nahash was in the habit of putting out the right eye of every Israelite that came into his power. Nothing more is told of Nahash until his death is mentioned; this occurred in the beginning of David's reign and was the occasion of David's message of condolence to Hanun, Nahash's son and successor (II Sam. x. 1-2). Nahashhad shown kindness to David; it is not stated what that kindness was, but there is a tradition that when David entrusted his family to the King of Moab (comp. I Sam. xxii. 3-4) the latter slew the entire family, with the exception of one of David's brothers, who escaped and found asylum with Nahash (Tan., Wayera, 25). Jerome ("Quæstiones Hebraicæ," on II Chron. xix. 2) suggests that David's sympathy was due to the fact that he and Nahash were common enemies of Saul. If the statement of Josephus ("Ant." vi. 5, § 3) is true, that Nahash was slain when the Ammonites were routed by Saul, the Nahash whose death David lamented must have been a different person. 2. Father of the Ammonite Shobi who took provisions to David during the latter's flight before Absalom (II Sam. xvii. 27-29). Ewald ("Gesch." iii. 250) thinks that Shobi was a member of the royal family of Ammon whom David had spared when he captured Rabbah, the capital of Ammon, and that consequently Nahash was not a king of Ammon. 3. A name mentioned once only, in II Sam. xvii. 25, in connection with the parentage of Amasa, who was the son of Ithra and whose mother was Abigail, daughter of Nahash and sister of Zeruiah. As Abigail and Zeruiah are given in I Chron. ii. 16 as sisters of David, three assumptions are possible. 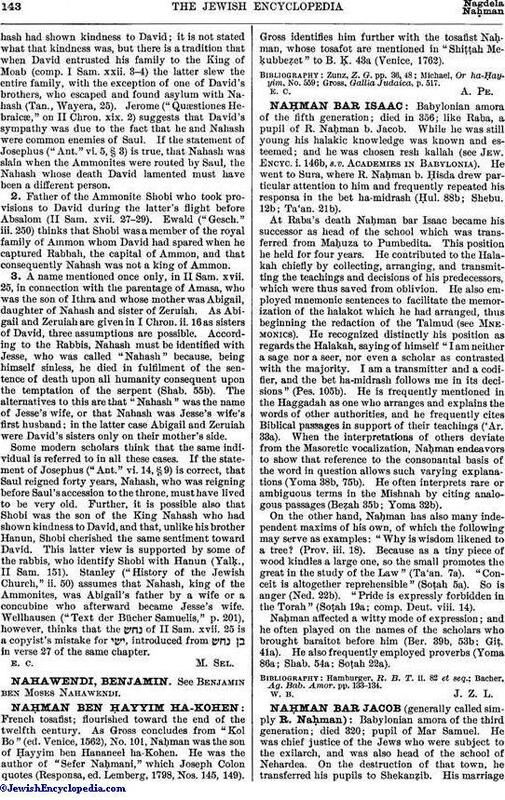 According to the Rabbis, Nahash must be identified with Jesse, who was called "Nahash" because, being himself sinless, he died in fulfilment of the sentence of death upon all humanity consequent upon the temptation of the serpent (Shab. 55b). 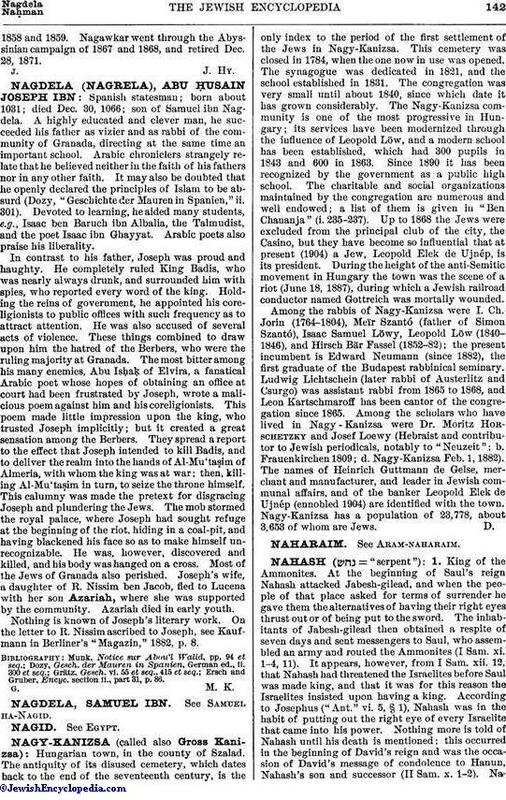 The alternatives to this are that "Nahash" was the name of Jesse's wife, or that Nahash was Jesse's wife's first husband; in the latter case Abigail and Zeruiah were David's sisters only on their mother's side.Some modern scholars think that the same individual is referred to in all these cases. If the statement of Josephus ("Ant." vi. 14, § 9) is correct, that Saul reigned forty years, Nahash, who was reigning before Saul's accession to the throne, must have lived to be very old. Further, it is possible also that Shobi was the son of the King Nahash who had shown kindness to David, and that, unlike his brother Hanun, Shobi cherished the same sentiment toward David. This latter view is supported by some of the rabbis, who identify Shobi with Hanun (Yalḳ., II Sam. 151). Stanley ("History of the Jewish Church," ii. 50) assumes that Nahash, king of the Ammonites, was Abigail's father by a wife or a concubine who afterward became Jesse's wife. Wellhausen ("Text der Bücher Samuelis," p. 201), however, thinks that the of II Sam. xvii. 25 is a copyist's mistake for , introduced from in verse 27 of the same chapter.